The confirmed death toll from the earthquake in Christchurch, New Zealand, now stands at 71 — but Prime Minister John Key has warned that it is expected to rise. This morning, local time, Police reported that no additional people were found alive in the rubble overnight. Many buildings have been flattened, and some sectors of the city are damaged beyond probable repair. Around 80% of the city lacks water, some neighborhoods are flooded, and sewage lines have ruptured throughout the city, raising fears of disease. These relatively lightly damaged shops happen to be a few blocks from my high school. Tuesday's earthquake was particularly devastating because it occurred on a previously unknown fault line. Growing up, while all New Zealanders are aware of the risk of earthquake — that the same forces that gave us hot springs and boiling mud also gave our very earth a latent, awful dynamism — it was always sort of generally understood that if the Big One happened, it would happen in the nation's capital, Wellington. Wellington sits on a notorious and complicated network of faults. Christchurch was, for all appearances, about as geologically active as the enormous, many-thousand-years extinct, volcanic cone that forms Lyttelton harbour and the Port Hills that loom to the city's south. The nearest fault, the Alpine Fault, lies many hundreds of miles to the west, in — as the name suggests — the Southern Alps. Earthquakes happened in the South Island, sometimes big ones, but they were centered in faraway places where nobody lived, like Fiordland, and when they reached us, they did little beyond rattle the plates in the cupboards, or open a crack in the plaster on the ceiling. "Christchurch has never been identified as a major earthquake zone, because no one knew this fault ran beneath," says a seismologist at the British Geological Survey. Now we do. In fact, it appears that an entire extra spur branches from the Alpine Fault and takes a hard right turn due east, to the city. This also explains the magnitude 7.1 earthquake that occurred near Christchurch less than six months ago. And thanks to tens of thousands of years' worth of stored energy, this fault is likely to be highly volatile. 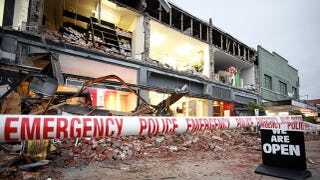 This most recent quake is likely to be New Zealand's worst in recorded history. And again, this is hardly a country in which seismic threats are unknown.